Robi 4G 100GB Bonus Internet Offer 2018! Hello Dear, Welcome to Robi 4G 100 GB Bonus Offer. 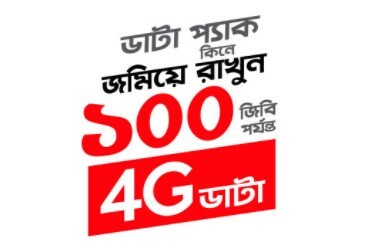 The Bangladeshi most popular and 2nd biggest telecommunication company brings an advance super internet offer for their valuable Robi 4G Enable SIM User, whose name is Robi 100 GB 4G Internet Bonus Offer. All the Robi connection users are eligible to enjoy Robi 4G 100 GB Bonus Offer. Under this offer, customers get up to 100GB Bonus internet only for browsing iflix, RobiTV & Mysports by using 4G activate SIM, 4G Enable Device and 4G Coverage Area. If you are a Robi connection users and want to know the details info about the Robi 100GB 4G Data Bonus Offer, Just follow the below content. The 4G content bonus can be used to browse iflix, RobiTV & Mysports only. Not applicable for the day packs, social & video packs and promotional packs. 4G pack validity will be 30 days from the day customer latched on 4G network with 4G handset, USIM. Thanks for staying with us a long time and visiting Robi 4G 100GB Bonus Internet Offer 2018 content. If you have any question about the Robi 4G 100GB Free Internet Offer 2018? Just comment here. We reply as soon as possible.